Coffee and slate: two great things that go together. 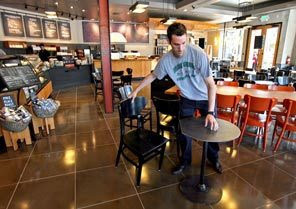 Yesterday, the Seattle Times reported that Starbucks is putting a new look into some of its stores. Primarily, the corporation is planning to use more recycled and reused building materials. What struck me most about the article is that the new menu boards at the remodeled stores in Seattle use chalkboards from Garfield High School. Those chalkboards, which I (along with previous Garfield attendees Quincy Jones, Jimi Hendrix, and Bruce Lee) may have used when I attended Garfield in the 1980s, are made of slate. Blackboard slate came primarily from Lehigh and Northampton counties in Pennsylvania. The metamorphosed stone began as a sediment deposited in an ocean, when rivers carried clay, silt, and sand off North America and out into a deep marine basin. 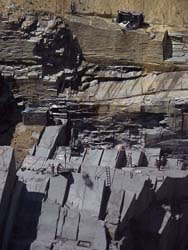 The 450-million-year old sediments first formed into shale, followed tens of millions of year later by metamorphosis to slate, under thousands of feet of rock. At present, up to 7,000 feet of slate beds make up the valleys and ridges around Pen Argyl, 60 miles north of Philadelphia. Blackboards are a wonderful teaching tool. They don’t break or warp. They can be cleaned indefinitely, either with an eraser or with your hand. They produce a pleasing click-clack sound when written on properly. Often taking up an entire side of a room, they provide a huge space for jotting down anything from music to drawings to numbers. They also seem eternal and permanent. Just think of the photographs of Einstein, or any number of mathematicians and physicists, writing out elaborate equations on a blackboard and you will recognize the role they have played in education and communication. Or consider how our use of blackboards has seeded our language. We wipe the slate clean or start over with a clean slate. We chalk up something to experience. We refer to a tabula rasa, literally a scraped tablet, but more often defined as a clean slate. We vote for one of a slate of candidates. We are slated to do something and those who had a debt were formerly said to be on the slate. No other stone has contributed a comparable literary etymology. I am happy to see the reuse of the slate from Garfield by Starbucks. I am lucky to have my own slab of that slate as well. The only downside is that Garfield now has those ugly, petroleum based whiteboards instead of the wonderful blackboards of my youth. Perhaps the school district can be inspired by Starbucks and reuse slate. It is certainly more environmentally hip than whiteboard. What is amazing is how smooth, uniform, and strong it is. Great stone! And now I know who bought up the last of the sheets from the reuse stores! Damn Starbucks! Luckily we got the very last piece to complete our project…. I so enjoyed hearing you with Ian Punnett on Coast to Coast. It was a delightful hour. I wish he would have you back on for an entire show. I've also read most of your blog and find it delightful, as well. It's nice to know that you are nearby in Seattle.